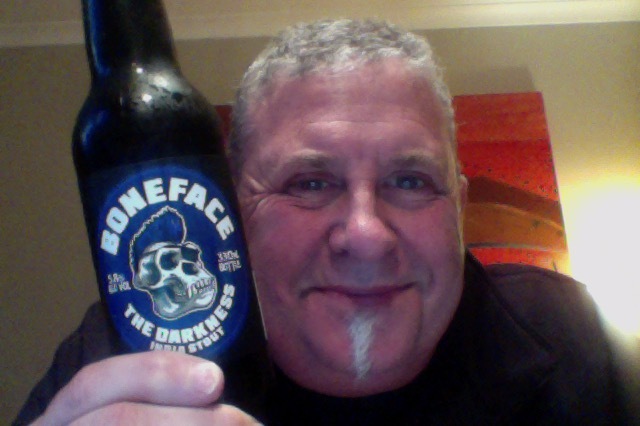 Boneface – The Darkness India Stout. – the rework. Turns out the banter was more than that and the brewer sent me another bottle, they’ve bottled it to a smaller size, and they say this is reworked a little with different hops, and improved, they also sent me a new beer which comes up shortly. This then a solicited beer, and a gift from the brewer, what could possibly go wrong. ..the usual notes of chocolate and coffee.. This is 330ml of a beer that is 5.8% ABV and 184 calories a serve size, this is 1.5 standard drink units in NZ. Brewed at Boneface brewing, a new craft brewery fresh out of Upper Hutt, right next to the likes of Panhead and Kereru. The Darkness is an Indian Stout – with characters of rich chocolate and coffee malts dominate with a hop kick of fresh citrus flavours and a malty rich finish! The Darkness is a special India Stout with the usual notes of chocolate and coffee you might expect. Yet it hides a secret. With a huge citrus kick you won’t see coming, the Darkness is an aptly named beer of wondrous flavour. So what could possibly go wrong? In the tradition of not looking at the previous post this will be pretty much a new tasting. Aroma is hoppy on opening, and chocolate, darker than lighter. Pour is a pitch black beer with a lovely coffee brown head. I made a complete lash of the pour and I’m sure it’s not quite as lively as it looks, it is settling down to something a bit more manageable and normal. But a bigger head is better than a film in my books so get in! Aroma in the glass is green hoppy and an undertone of chocolate roasted. notes. Lovely bitterness, a small gap where you might expect some fullness, but then a wash of bitterness to a lovely smack of a finish that is bitter, which leads to a lovely lingering bitterness at the back. This is an IPA, I remind myself, there is no reason to expect a fullness in the mouthfeel, that fluffiness. When you’ve reset that the bitterness works well across that curve quite well, and the finish is enjoyable. This seems so much more balanced, where before I got grassy bitterness at the edges this seems to have gone away, and entered itself into a decent kiss at the finish. Whilst I might like more oomph in the middle this is much more enjoyable beer this time around. Still get some of that raw hoppiness which is nice, but that’s not the all. I like it a lot more this time, it’s like a different beer. A better one. So the story is get the 330ml bottles if you want a smoother rounded beer, the taller 500ml if you want grassy edginess that might not work over the whole drink. The pdubyah-o-meter rates this as 8+ of its things from the thing. ( 8 is better than good, 9 is great, this is in the middle there, Im loath to give 1/2’s then I’d have to give 1/4’s.) This is really nice to drink the initial bitterness comes back to the beer, and levels out over the whole drink, the previous edgy bitterness has gone to the centre and this has become quite a nice black IPA that is easy drinking and quite enjoyable. Am I enjoying it? Yes. Darn the small bottle I would enjoyed the pint! Would I have another? I’m picking the smaller bottles might make 4 or 6 packs, and I probably would. Would I share with a friend on a porch and set the world to rights? This version yes, tasty and easy drinking, light bitterness but with a constant curve that makes it easy drinking and good to have around for that serious chat about how good your team are this week, or last, or next. Melodrama is the second studio album by New Zealand singer Lorde. I struggled with the most of the album, it’s like all the tracks are introspection and self-indulgent woe is me my boyfriend left me, that might appeal to anxious fraught teenagers, but it lacks real substance or powerful lyrics. 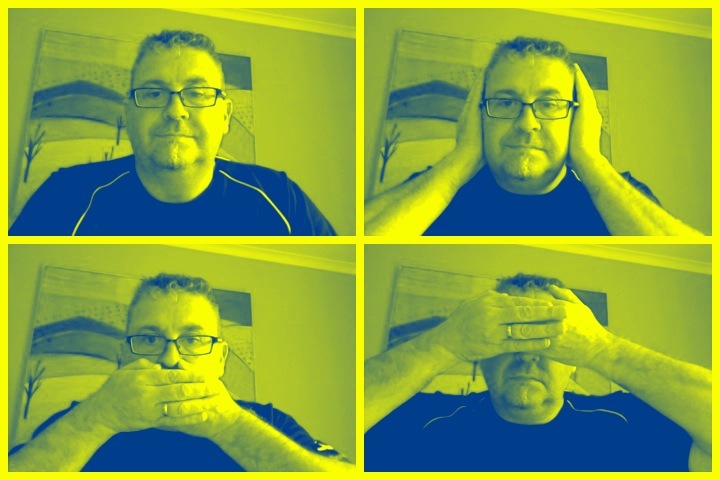 Some of the timbre is same/same/same and the odd violin or strings don’t really do much for this. It’s a solid second album, but it means that it’s the edge from here and its either up or out the back for the 3rd one, if you can wait 3 years or more for that. 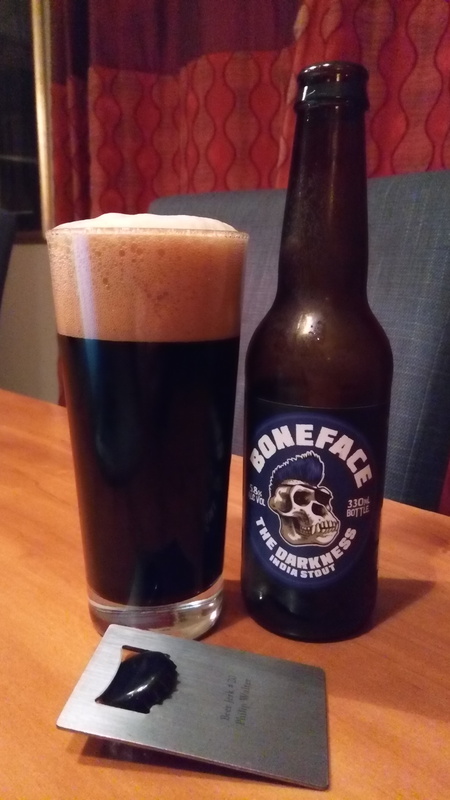 This entry was posted on June 16, 2017 by Philip Walter in Beer, Beer of New Zealand, Beer Review, Black IPA, BoneFace, Craft Beer, Critic and tagged Black IPA, Boneface brewing, Boneface The Darkness India Stout, craft beer, craft beer review, Stout.